Buckwheat banana bread tastes awesome and smells divine as it bakes. It’s easy to warm up in the oven for a nice breakfast or to bring to work as a healthy snack. This buckwheat banana bread recipe is super easy and makes enough to last about a week. We usually finish it in a few days though – it’s just too good to have sitting around. I love cooking with buckwheat because it’s essentially a super food – super nutritious – and it’s gluten free. Buckwheat is awesome because it has a low GI index and thus slowly releases energy and does not spike blood sugar levels. Buckwheat is not technically classified as a grain, but rather a fruit seed related to rhubarb. Buckwheat contains a significant amount of protein, and is a great source of dietary fiber. It helps regulate blood sugar, cholesterol, blood pressure and is high in magnesium and flavonoids which help keep disease away. Check out our buckwheat porridge recipe for a healthy buckwheat breakfast option. Ideally, I like to start my morning with a steaming cup of tea, soon followed by a fresh mixed juice. But I do eventually get hungry and when that happens I have the most voracious appetite. I wanted a healthy version of the classic banana bread recipe that would be gluten, dairy and sugar free and still provide nutrition and, equally important, satisfaction for my taste buds! I created this buckwheat banana bread recipe using a natural sweetener (you can use honey or palm sugar or agave syrup or maple syrup) and coconut oil. I like it so much, that I have made it 5 times over the past month and had it for breakfast almost every day. It also makes an awesome breakfast. The best thing about it is that you can make a double batch and it keeps really well in the fridge. You can easily take it anywhere – to the office, as a snack on a day in nature or pack it for your kids! The second best thing is that there are so many possible variations to this buckwheat banana bread recipe that you can make a different version every time and never get bored. Here it is finally! I drizzled palm sugar sirup on top of it for some extra sweetness. Sometimes I even add palm sugar chunks into the buckwheat banana bread mixture so I get pockets of palm sugar caramel oozing out. OOOOH YUM! 3/4 cup of buckwheat flour. 6 tbsp honey or palm sugar or agave syrup or maple syrup. 1/2 tsp vanilla extract, or vanilla powder, or half a vanilla bean pod. 1/2 tbsp cinnamon or more if you love the spice. 2 small eggs or 1 very big egg. 1/3 cup coconut oil (if it has turned solid, just warm it up slightly) or you can substitute with olive oil. 2 large (almost over) ripe bananas. 2/3 cup chopped walnuts – or you can substitute for your favorite or mix up several nuts. 1/2 to 2/3 cup dried fruits – raisins, chopped figs, plums, apricots or any kind or mix thereof. Optional: you can add some goodness by adding a spoonful of chia seeds, linseeds or even coconut flakes. Don’t add all at once though. You can also soak the nuts overnight (here’s why you should soak nuts, btw) and then chop up right before you use them. Step 1: Preheat the oven to 180 C or 360 F.
Step 2: Grease and dust your bake form. Step 3: Make the cake batter. In a large bowl, mix all the dry ingredients – flour, baking soda, salt and cinnamon. In another bowl, mix all the wet ingredients – your choice of natural sweetener, eggs, oil and vanilla. Add the wet to the dry ingredient mixtures and mix well. Add the mashed bananas, nuts and dried fruit. Mix some more. Step 4: Bake it baby. Pour into your bake form and put it in the middle of the oven! Bake for about 25 minutes then check with a toothpick if it’s ready. The toothpick should come out clean if it’s fully baked. If it’s not it may need a bit more time – keep checking every 2 to 3 min. You can let it cool down a bit…or just eat it right away, it’s good both warm and chilled! Store in the fridge or a cool dry place. Looking for other healthy breakfast or snack recipes? Try this super easy honey oatmeal cookies recipe. 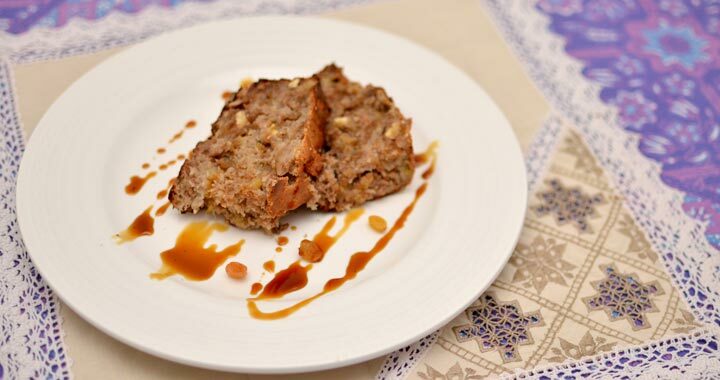 Have you tried this buckwheat banana bread recipe yet? What mix of nuts and dried fruit did you use? Share your experience with us in the comments below. We would love to hear back from you. Posted in Baking recipes, Breakfast recipes, Dairy free recipes, Gluten free recipes, Quick and easy recipes, Recipes, Snacks, Vegetarian recipes and tagged banana, banana bread, buckwheat, buckwheat porridge, coconut oil, healthy, healthy snacks, honey, nuts, palm sugar, raisins. Pingback: Late dinner - how to keep it healhty? Love them! Used pecans and chia. Had to dry my own Apple slices because I had no dried fruit in the house! Not too sweet. Kids have taken them to school today. Think these will be a lunch box regular. Thank you, Elyse, we’re happy to know that the kids are enjoying this recipe And such a great idea with pecans, chia and dried apples! So good! I used 1 cup of a mixture of walnuts coconut and raisins and some ground flax. Plus at the end I pushed in some frozen raspberries and small chunks of dark chocolate. Putting a long strip of banana on top looks so pretty! Delicious! Just baked this and it has turned out so beautifully! I used coconut syrup as my sweetener, and I also doubled the recipe as I had to use up the bananas before they went bad and it is by far the best gluten free banana bread I have ever tasted. If I hadn’t baked it myself I wouldn’t believe it was gluten free! So fluffy! Thank you!